As the spring equinox brings in a new season, kids get excited about things like new blooms, bright colors and warm sunshine. Celebrate the changing weather and nurture an appreciation of the season when everything comes to life with this fun, first day of spring activities for kids. Looking for a simple way to get outdoors and enjoy the first day of spring? 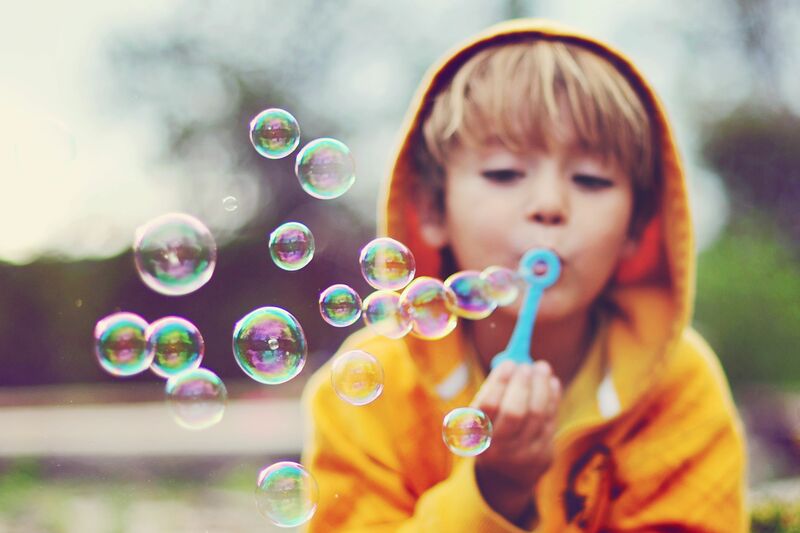 Blowing bubbles is usually a hit with kids of all ages. Even better than just blowing them is making them yourself with a few supplies you probably already have on hand. Once you mix up a batch, you can also try some of these backyard games to play with bubbles. Spring feels like a magical time. Help kids celebrate its arrival by making a batch of magic potion. They can collect natural ingredients from the backyard (berries, flower petals, leaf clippings) and mix them up with a solution of colored water and glitter. Then have them pour it in the grass or garden to help make things grow and blossom. Need an idea for a spring equinox party for kids? This party theme celebrates everything floral with ideas for flower-themed decorations, cake, crafts, and games. From mailboxes to milk cartons, to even old shoes, Birding Expert, Melissa Mayntz shares how to turn them into birdhouses. Prefer to make a feeder? Check out this collection of bird feeders for kids to make from Amanda Rock, Preschoolers Expert. Take kids to the garden center and have them pick a vegetable they can plant, grow and eat. Once they have planted their veggies, look up some fun recipes that feature them as the main ingredient. Plan a meal for when their veggies will be harvested. What can you see in springtime that's different than the rest of the year? Flowers that only bloom in spring? Pine cones uncovered by melting snow? Berries the sprout on that bush in the yard? Get together with the kids to compose a list of things nature brings at springtime. Then go out and collect a sample of each. Want to turn it into a competition? Make two lists, split into teams and race to see who is the first to retrieve everything. Spring is a lovely time to get outside and take some photos. Challenge the kids to scope out the best spring backdrop for which to pose for photos. Then print them and let them use them to make spring scrapbook pages or frame them as Mother's Day gifts. Sure, spring is known for sunshine and flowers, but it also tends to boast a fair amount of rainy days. Don't let the season's sogginess get you down. Instead, throw a party that celebrates the wet weather with rain-themed food, fun, and favors. What are Good Games for Kids To Play on Earth Day?